Yes, this is a familiar feeling. I recognize it– and I don’t like it. I would imagine, too, that it’s almost universal: that sense of having a deadline, Something Due, and so everything else must wait, or take a back seat to it, anyway. Of course, deadlines are helpful. Even necessary. I have talked about this before. I have always been grateful for deadlines– but that doesn’t mean I like them. I find it especially difficult as a mother. Certainly I faced deadlines before I was a mother, and they were troubling (and helpful!) enough back then. But as a mother, the pressure of a deadline takes on side-effects that I don’t much care for. Because right now, my kitchen floor is filthy, and the Entire House wants a good vacuuming, and this morning I caught the dying mint plant only just before it kicked the proverbial bucket: it is now reviving nicely (freshly watered) on the deck. But a few hours’ more neglect and it would have been money (very) poorly spent. This is not to say that I didn’t (necessarily) have floor-scrubbing, carpet-vacuuming, plant-watering duties before I was a mother. But it is to say that, around the edges of meeting a deadline, I have only enough (also) time to take care of my family– and Nothing Else. It begins to wear on one, doesn’t it? : the Noticing of all that one must tend to, and the Not Being Able To Get To It. Yet. But once again we are closing in. Tomorrow evening, in fact, at 11:59, I am Absolutely Committed to sending this New and Improved draft of my novel to my editor– and this will be the first time that anyone at all (other than me) has read the entire thing in full, and then I won’t be (Oh, I am So Glad) alone in this project anymore. Until then, it is all hovering over the computer for me. Yes, I took Sunday off. But most of Friday and Saturday were spend reading, reading, reading the manuscript. And yesterday it was all about tending to my notes and making those additions, those vital little pieces that must be inserted here and there if the thing as a whole is going to make sense. Today it is more of the same: my head locked in this little story, my mind overtaken by these characters and plot– so that everything else (nearly everything else) must take a backseat. Focused in this way on this small thing, the rest of the world grows unfamiliar. It weighs on my brain as annoyance, as tedious and distracting obligation. Last night, tired beyond what seemed reasonable, I had to make myself quit the book and go to bed– and read Something Different, just to clear my mind. We as a family have faced this before: way back when I wrote my Master’s thesis; or when I was writing curriculum; or when, periodically, it was time to grade essays, write report card comments, grade and comment on a new raft of papers. Mom in the throws of some assignment-or-other, working hard against a deadline. Yes, we are all too familiar with this. Yesterday it was so bad that I didn’t even take time to exercise– something that is ohsogood for a hard-working brain. I asked Emma and her friend Jewel to walk the dog–which they gladly did, and let her off the leash, and didn’t notice until it was too late that she had rolled in something rotting (“it had maggots!,” they told me), and consequently bathed her in the backyard using Will and Everett’s Old Spice Denali body wash because we are out of dog shampoo. And then for the rest of the evening, the dog smelled like wet dog (yuck) and Denali body wash, which is really quite pleasant. 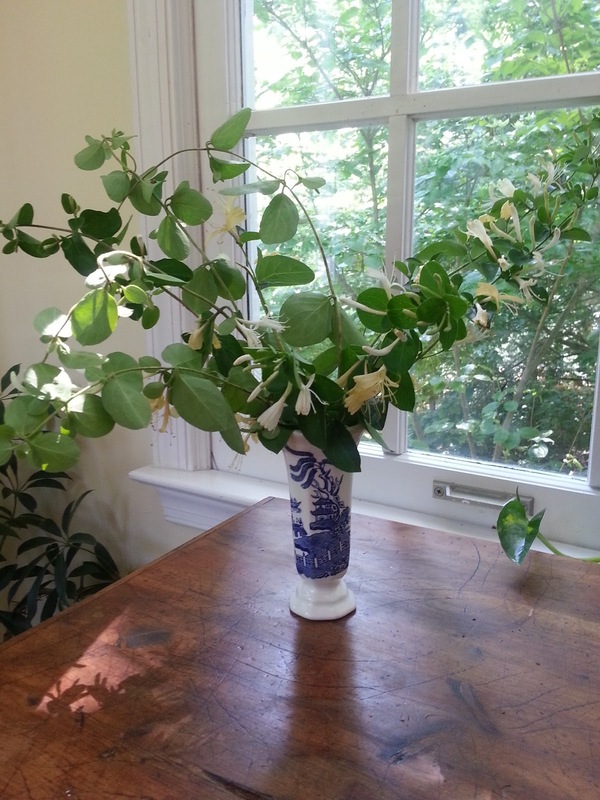 Emma also brought home to me a fistful of honeysuckle– and I wouldn’t have known but for that bouquet that it is blooming now all along the edges of the woods. It’s in a little vase on the kitchen counter, and it smells wonderful. I remember my father introducing me to honeysuckle when I was maybe six, discovering where it grew in a hedge up the road from my grandparents’ house on Long Island. He taught my sisters and me how to choose the ripe blossom and pull it off the vine, how to break and then tug so gently at the pedicel and so pull the filaments through. At the base of the filament: treasure! The sweetest drip of honey that we sucked right off the plant. Later I showed this to my children. It grows so near our house. William was probably two when I showed it to him for the first time; the same was likely true with the others. But they’ve always loved honeysuckle since then, and I distinctly remember one of them (Everett?) instructing me as to the parts of a plant (pistil and stamen, petal and style) when he was (maybe?) in the first grade and learning about the parts of a plant. Which made me think that someone (who?) does the drawings for Merriam-Webster. Someone has that job– a botanist, maybe. And she works against a deadline, perhaps, to get her drawings in on time. But for me it was an escape: looking up the image, writing this blog post, standing a moment too long at my kitchen counter and inhaling– not wet dog– the smell of the honeysuckle there. We will get past this deadline, as we have all the deadlines before it. I walked the dog this morning. A brisk walk that my entire self– mind and body and soul– was so glad for. And in a shady patch down where the creek overflows its banks after rain, I saw a little tree– a dogwood, maybe?– that was all entwined in honeysuckle. The tendrils brooded over the top of the tree, hanging down like a lock of hair, all yellow and white with blossoms.